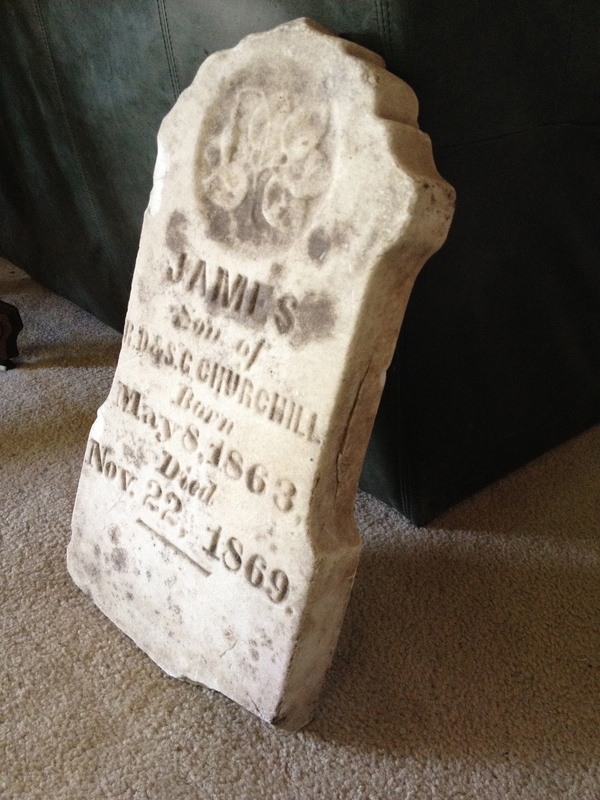 James Churchill was born May 8, 1863 and died Nov. 22, 1869. He was 6 years old. I do not know where he was born. Presumably he died near Leavenworth, Ks., since he was buried there, by the Missouri River. More than 125 years later, his tombstone was found, upside down, in an open field. I have searched high and low but have found no record of his birth or his death. I believe I have identified his parents. The tombstone lists his parents as R.D. and S.C. Churchill. I believe they were David R. Churchill and Sophia C. (Brown) Churchill. I find no record David and Sophia had a son named James, but they had other children in this same time period. James was born 2 years after the civil war began, and died 4 years after its end. Most residents of Leavenworth in 1863 were pro-union, since Camp Lincoln, in Fort Leavenworth, was a reception and training center for Kansas volunteers for union soldiers. Since it seems unlikely confederate loyalists would live within the shadow of a Union stronghold, that suggests the family held anti-slavery beliefs and, more likely that they moved from the North or the East. Of course, nothing is certain. I doubt the family was traveling west. In 1862 David Churchill lived at 211 Delaware in Leavenworth. Someone in the family is listed as a member of the Mayflower Society which may be helpful, because it suggests a family with an interest in its own heritage. The stone itself evidences a certain level of affluence for Kansas in the 1860’s. It is not illegible, like many stones from the late 19th century. Even after so many years of being subject to the weather, it is a substantial stone, with the family information clearly carved and easily read.